The coordination between Trump administration officials in Washington and the Venezuelan opposition in Caracas couldn’t have been more obvious. 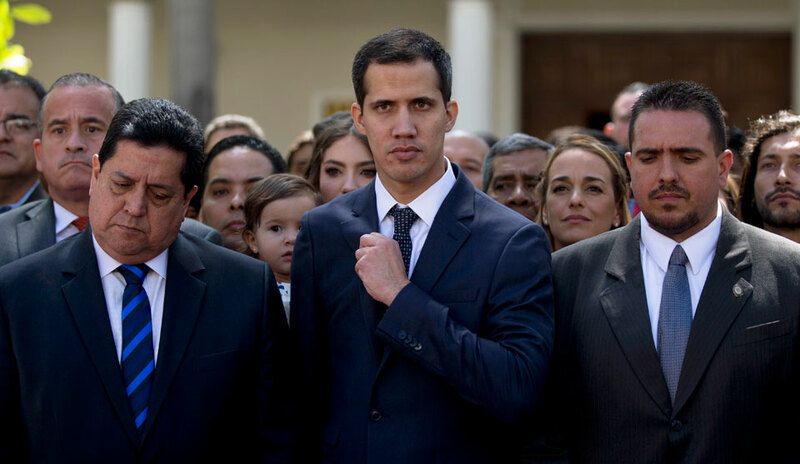 Midday Wednesday—on the anniversary of a 1958 coup in Venezuela that overthrew a dictator—Guaidó called for the military to rise up against Maduro and declared himself the acting president. Minutes later, the White House announced its formal recognition of Guaidó as Venezuela’s head of state. Shortly after, Maduro severed ties with the U.S. and gave diplomatic staff 72 hours to leave the country. A largely unknown figure before he catapulted to head the country’s legislature earlier this month, Guaidó was a founder of the extreme right-wing Popular Will Party, along with Leopoldo López, known for his role in provoking deadly riots in 2014 that cost 43 people their lives. Guaidó is an engineer by trade and a graduate of both George Washington University in D.C. and the Instituto de Estudios Superiores de Administración. The latter is Venezuela’s most elite business school; it played a key role in drafting the neoliberal economic policies of the governments that preceded the late President Hugo Chavez. Guaidó first declared himself interim president on January 11 and was arrested by government intelligence officers under cloudy circumstances two days later. He was almost immediately released, apparently on the order of Maduro. Communications Minister Jorge Rodriguez said that the officers involved were already under internal investigation for “conspirational links” with extreme right forces before they had arrested Guaidó. He said the arrest was actually a provocation carried out by opposition supporters within the intelligence services in order to spur Guaidó’s backers into action. The far-right government of Jair Bolsonaro in Brazil also joined in, declaring that the Venezuelan presidency “now corresponded” to Guaidó. Luis Almagro, secretary general of the Organization of American States, did the same. All were laying the groundwork for other governments—and especially the United States—to shift official recognition to Guaidó. Before Washington made the switch official, many countries had already done the same, including Canada, Chile, and Colombia. On Monday, January 21, there was a short-lived mutiny of soldiers in a barracks in Caracas in which weapons were stolen. It was quickly put down, but Guaidó held it up as a supposed example of mass unrest within military ranks toward Maduro. He promised amnesty to any soldiers who take up arms against the government. Tuesday night, January 22, saw a number of provocations, including clashes with police that killed four people as well as the dramatic burning of a statue of Hugo Chavez in the city of San Felix. It was all preparation for today—January 23—when the opposition and Washington launched public coordinated attacks in an attempt to push for the full overthrow of Maduro. The constitutional basis for Guaidó’s position as National Assembly leader, much less as head of state, is already in question. The legislature and all its acts have been declared “null and void” by the country’s Supreme Court. Guaidó persists in asserting the authority to replace Maduro, however, so constitutional constraints seem to be of little concern. Fears are now rising that more direct U.S. intervention may be forthcoming should Guaidó’s efforts on the ground fail. It was confirmed by a former U.S. official last September that Trump administration officials met with renegade Venezuelan military officers who were planning a coup against the government. There is no evidence Washington has ended such efforts in the months since. On the contrary, the recognition of Guaidó as head of state is a clear escalation of U.S. efforts. Maduro, however, so far appears still able to rely on the support of the bulk of the military as well major sections of Venezuela’s working class and poor. 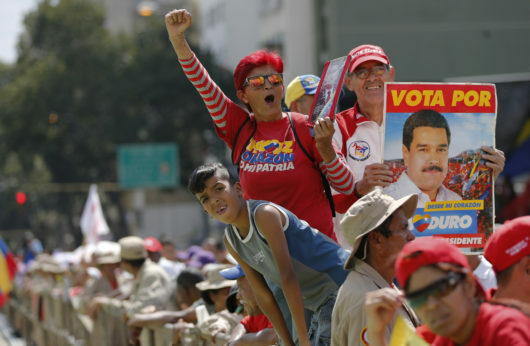 The social welfare and education programs that have defined the “Bolivarian Revolution” in the minds of many Venezuelans since Chavez was elected 20 years ago still keep many on the side of the government. 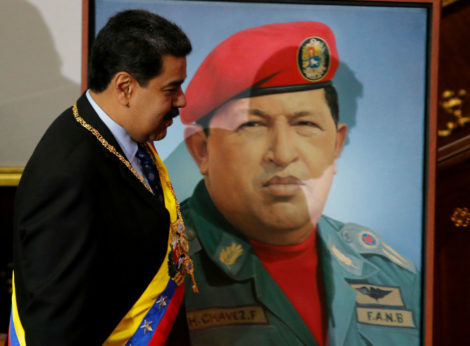 An economy wracked by hyperinflation, product and food shortages, U.S. sanctions, declining oil prices, and government mismanagement are increasingly undermining support for Maduro, though, who succeeded Chavez in 2013. Up to three million people have left the country and even Maduro’s allies in the Communist Party of Venezuela have criticized his government’s “inaction” and “lack of response” to the hardships being faced by workers and farmers. The policy failures of the Maduro government, combined with a prolonged campaign of intentional economic sabotage by Venezuelan capital and its international allies, have brought the country to the desperate situation of the present. 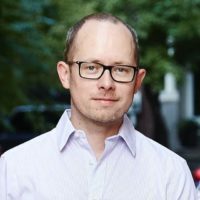 With the actions taken by the opposition and the Trump administration over the last 24 hours, it appears as if the calculation has been made that Maduro’s domestic support might now have withered sufficiently to allow for an unconstitutional seizure of power—and if necessary, a military coup—to finally remove the socialist government from office. Today’s formal recognition of Guaidó by Trump is aimed precisely at speeding up that outcome.